Take Care of Texas is proud to expand their partnership with H-E-B. A Take Care of Texas/H-E-B partnership is a natural fit because H-E-B makes sustainable practices a part of their daily business. H-E-B believes their work to care for the environment not only makes them better neighbors—it helps them better serve their customers. By being energy efficient and conserving natural resources, they not only Take Care of Texas, they create savings passed on to their customers in the form of everyday low prices. 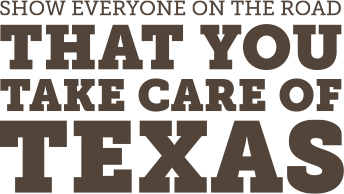 For many years, H-E-B has included the Take Care of Texas slogan on their reusable grocery bags and has now offered to expand their commitment. Follow H-E-B through social media, the My H-E-B Texas Life quarterly magazine, and H-E-Buddy booklets to see their commitment to Take Care of Texas. Explore some of the other ways H-E-B is doing their part to Take Care of Texas.